“Edgy baby furniture” isn’t exactly a phrase you hear that frequently. Because exactly what is edgy about a plain white crib with a stork decal slapped on the side? Not much, unless your baby is Gene Simmons and decorating ironically. The latest launch from Pottery Barn Kids, however, may change that. Lucite tables! Art deco cribs! Baby’s first Eames chair! It’s a whole new world of nursery decor, and we’re all for it. Dubbed Modern Baby, this brand-new collection spans five nursery aesthetics and has everything from sturdy furniture to whimsical decor. All the furniture is Greenguard-certified, everything is carefully constructed, and even the bedding is made from 100 percent organic cotton — so parents, rest assured that you aren’t sacrificing safety and quality for style. As such, each of the five styles is definitely adult-approved. Inspired by everything from art deco to classic Scandi style, there’s something for every design-savvy parent (or particularly enlightened baby). The first two styles, Casual Modern and Natural Modern, are probably the best bet for a more traditional look. Both rely on a pared-back, simple aesthetic; with Casual Modern, animal-adorned accessories add a sweet finishing touch offset by natural wooden accents and white furniture. Natural Modern, the clear Scandinavian influence of the bunch, is all about neutrals, lighter wood tones, and textiles brought in through pieces like a faux Mongolian fur rocker or a geometric textured rug. Minimal Modern, for the baby destined to be a mini-Marie Kondo, is black, white and perfectly sleek. Crisp and cool, this contemporary collection demands a lot of smart storage to keep clutter at bay and ensure the furniture is the center of the room. As the name suggests, Hip Modern is bold, edgy and graphic. Pieces like a gold velvet ottoman and acrylic wall shelves are so hip, in fact, that adults might want to go ahead and commandeer some of these pieces for themselves. Über-trendy and full of some of 2018’s most popular decor moments, the Hip Modern line is for the baby who has come out of the womb with an iPhone in hand and predetermined passion for avocado toast, ready to be a mini Instagram sensation. The last collection is also the most detailed one, with two colorways perfectly optimized for customization. Glam Modern, available in both a black, white and gold option and a blush, cream and luxe metallic version, is heavily art deco-inspired. Sophisticated and opulent, pieces like a geometric pendant light and black velvet ottoman bring elegance into the nursery space. “I love that the collection allows you to create a beautiful and functional space whether your personal style leans towards minimalist, maximalist, or somewhere in between,” says Spampanato. 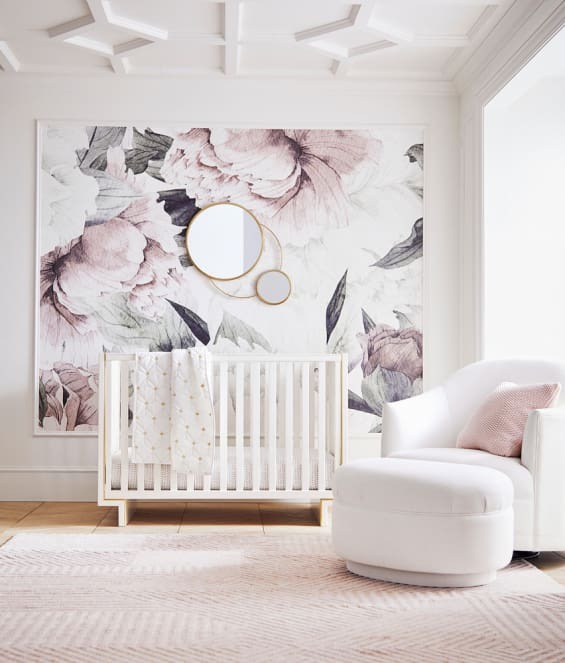 Pottery Barn Kids also teamed up with Chasing Paper for an exclusive removable wallpaper collection full of cool graphic prints to round out the Modern Baby line. The whole thing is available to shop now in both Pottery Barn Kids stores and online at pbmodernbaby.com, so you can try your hand at mixing and matching from each different style. Need some inspo? Head to Instagram and check out the dedicated account (@pbmodernbaby) for helpful decorating advice and fun content, all featuring the latest launch.